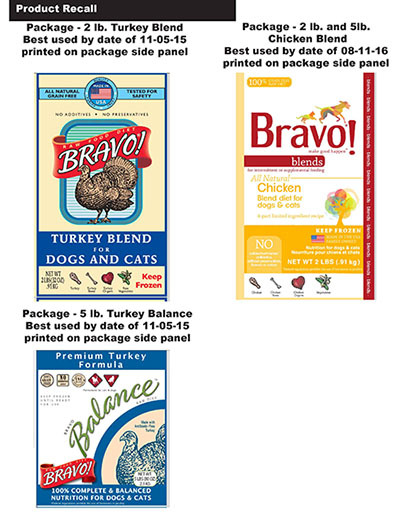 FOR IMMEDIATE RELEASE – September 26, 2014 – (Manchester, CT) Bravo of Manchester, CT is recalling select lots of Bravo Turkey and Chicken pet foods for dogs and cats because they have the potential to be contaminated with Salmonella. Salmonella can affect animals eating the products and there is risk to humans from handling contaminated pet products, especially if they have not thoroughly washed their hands after having contact with the products or any surfaces exposed to these products. The recalled product should not be sold or fed to pets. Pet owners who have the affected product at home should dispose of this product in a safe manner (example, a securely covered trash receptacle). Customers who have purchased the recalled pet food can return to the store where purchased and submit the Product Recall Claim Form available on the Bravo website www.bravopetfoods.com for a full refund or store credit. 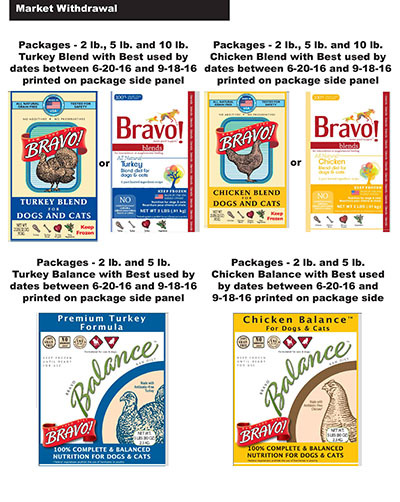 More information on the Bravo recall can also be found at www.bravopetfoods.com , or call toll free (866) 922-9222 Monday through Friday 9:00 am to 5:00 pm (EST).